A very strange “family” has moved into Boulder. 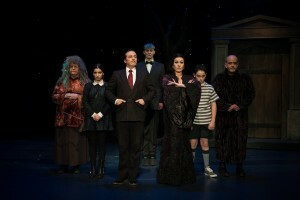 There is the father, Gomez, his luscious bride, Morticia, their two children – the very strange Pugsley and his sister, Wednesday, who has potential of being somewhat normal. Then Grandma comes with the group, as does Gomez’s brother, Uncle Fester. The family’s servant is an extremely tall chap, Lurch, who doesn’t say much but brings an air of frightening delight to the going’s on. 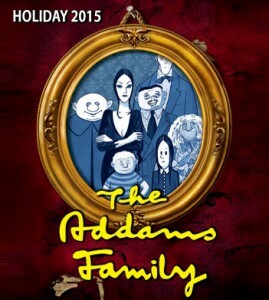 We meet the family on stage in “The Addams Family,” a musical version of the death-defying antics of cartoon characters created by Charles Addams. The cartoons resulted in a very successful TV run about the strange family. The gang was assembled for a Broadway production in 1960. The Broadway team had great credentials, but were not successful in giving life to the family. Even the amazing talents of Nathan Lane and Bebe Neuwirth could not surmount the script and music difficulties, however. 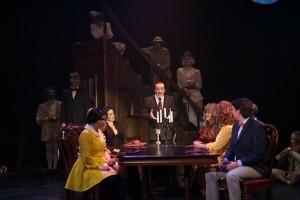 The show was subsequently rewritten, and is finding a new life of it own in local productions, such as the current Boulder show. The set is clever – the spooky mansion, the cemetery crypt, the ever-present trees! This is a cartoonish set design that is very effective. Wednesday realizes that her family is not normal, but confides in her father that she has fallen in love with a regular guy – Lucas Beineke. She has an “uncharacteristic desire to marry a square kid from Ohio!” She has invited Lucas and his parents to the family home, so that everyone can meet over dinner. There hasn’t been such a stage dinner since “La Cage Aux Folles” when a gay couple invited the Mayor of Paris and his wife to meet their heterosexual son who was about to marry the Mayor’s daughter. This time around there are not questions of gender, but problems of living and dead! Uncle Fester enlists the help of the dead ancestors who emerge from the family crypt for guidance and support at the family dinner. Scott Beyette has directed the show and stars as Gomez. Alicia King plays his wife, Morticia, with Sara Grover taking the role of their daughter, Wednesday. 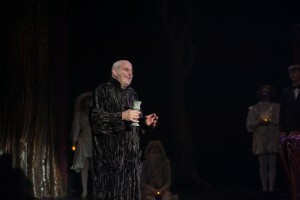 Wayne Kennedy is a delight as Uncle Fester, as is Casey Andree playing the solemn servant, Lurch. Barb Reeves plays the daffy grandma, and the role of Puglsey is double-cast, with Ethan Leland and Owen Leidich sharing the part. I saw Leland who is very good, especially when attached to his adored torture machine, giving him the opportunity to cream loudly in wonderful pain! Brett Ambler is convincing as the naive young suitor, Lucas Beineke, who finds the zany Wednesday to be someone special. Scott Severtson and Joanie Brosseau are effective as Lucas’ bewildered parents strangely horrified by the goings-on in the Gomez household. Scenery is terrific, as are the lighting, and costumes. The sound system did not permit me to understand some of the characters as easily as I had hoped. Songs are pleasant, but not after-the-show hummable. 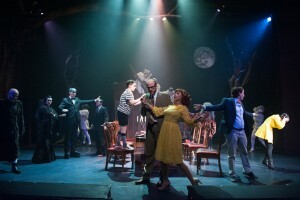 There is an especially fun scene when Fester declares that he is in love with the moon, singing, “the Moon and Me.” Dancing is spotty – with some good numbers, but an overly-long Tango near the show’s end. 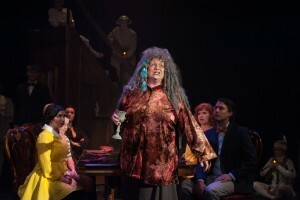 An interesting part of the production’s effectiveness is the presence of many dead ancestors who meander through the show, silently and effectively “commenting” on what is happening among the live folk. This is a blissfully ghoulish little show! Affectionadoes of early incarnations of “The Addams Family” will have a field day noting some of the comedic touches which have been handed from from cartoon format, to TV series, to the stage. The dark and brooking “look” of the family has been remarkably transferred in this goofy tale. And the food is very good!